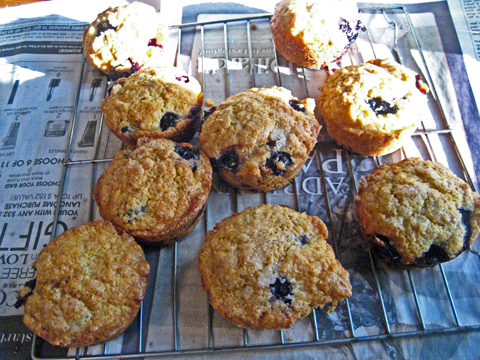 That's the Janice Kay Cornbread Muffins with Blueberries cooling before Cornbread Supper began this week. The big, fat, frozen Reed Valley Orchard blueberries went straight from freezer to oven, and it all worked out. They didn't lose their identities. More desserts that didn't get named, but included a handmade upside down cake and a pumpkin mousse/caramel corn extravaganza for which we may, in time, get to post a recipe.